Having a new baby comes with an adjustment period and having Andrew has been no exception. Andrew was about a month old. I was having a particularly hard day, trying to adjust to little sleep and still knowing I needed to take care of the rest of my family. Jonathan was working late and I was trying to cook dinner and hold Andrew at the same time. About this time my front door opens and it is my mom and my step dad. She comes in, sees my predicament and takes my baby from me so that I could finish cooking dinner and get some laundry done. She sat and loved on him for a good hour. Now, the small miracle in this isn't so much the act of thoughtfulness on my mom's part, it was an answer to my sadness that I had been feeling. My mom hasn't been able to be present mentally and physically in our lives for awhile since her Dementia has gotten worse. She has good days but lately more bad days than good. For the most part, all my siblings have accepted this and have helped where we can. But, I had been having a longing to just have my mom present for just a bit. I needed help and was feeling sad knowing that she is not someone that I can access for help. So, for her to just show up out of the blue with no warning was literally a miracle. This just doesn't happen. As I folded laundry upstairs, I said a prayer of gratitude for a small miracle that I needed at that moment. I am grateful to a Heavenly Father who is aware of my needs even if I don't ask for help. 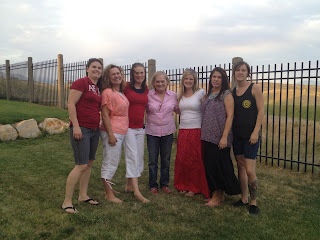 I am also grateful that my mom came that evening. I know I am not going to be getting very many more days and evenings like I had with her that night. Normally, waiting 45 minutes to cut the placenta is not dangerous. But, in my case with the placenta still being attached to me, it continued to pump blood into Andrew for to long. It gave him to much blood.I found out from a nurse later that usually after a baby takes his first breath it signals the placenta to stop pumping blood. In my case it did not. The EMT's arrived and I remember thinking so many different things. "Was my baby going to be okay?" "This is not how this was supposed to happen. I am supposed to be going home in a few hours to my house. I just did the hardest thing that I have ever done and I am not going to the hospital." Also, it is sort of silly now but I did not want all these strange men to come in. I was not dressed. I was embarrassed for them to see me like this. But, I think the hardest part for me was when they told me that the baby could not ride with me in the ambulance. They were taking him in his own ambulance so they could work on him separately. I cried and cried. He was not even an hour old yet and they wanted to take him away. Jonathan told me that he would not leave him. He would stay with him the entire time. That gave me a bit of comfort. I found out later that the head EMT told Jonathan that it was against policy to allow him to ride in the back of the ambulance. But, another EMT told Jonathan to forget policy and that he could ride in the back with our son. I am grateful for a kind act like this in such a stressful time. While I was in the ambulance, they hooked me up to another IV, a heart monitor and oxygen. At the time I really thought this was all overkill. I felt the same I had felt after giving birth to my other children. I was tired and weak and wanted to sleep. I would close my eyes and than the questions would start coming. He wanted to keep me talking and I was annoyed. I just wanted to sleep. I remember that he asked me my name 5 times and all I could think of was "why can't he remember my name?" So we get to the hospital and they take me straight up to labor and delivery. But, they could not get the bleeding to stop and they could not get the placenta to detach. A doctor came in and thought that it was just a stubborn placenta and started to push really hard on my stomach while trying to pull the placenta. It was so painful. I was screaming in pain for him to stop. It was worse than the labor I had just gone through. He said "if I can't get it to detach than we will have to put you under and take it." I told him to do that. It ended up being a big blessing that it didn't come off on its own. I had what was called placenta accreta. This is where the placenta has an abnormally deep attachment to the uterine wall. If he would have been able to detach my placenta it would have ripped out part of my uterus and caused all kinds of problems. Of course we did not find any of this out until he actually put me under. When I woke up, I was back in my room. I was getting a blood transfusion. I found out later that I had lost a total of 3200cc of blood which was about half of my blood volume. In the meantime Andrew was up in NICU. They were trying to help him breath better and they also had to drain some of his blood out of his body. The doctor told Jonathan that this was very dangerous as his blood could become to thick and cause a stroke.They were also worried of infections so they started him on antibiotics. All I wanted to do was get up there and feed him and hold him. It was just killing me to be separated from him. I ended up not being able to go see him until about 7:00 that night. He was hooked up to so many wires. There were two coming out of his belly button. A heart monitor, a breathing monitor and blood pressure monitor. I could barely hold him and I just wanted to cry. But, I was so very grateful that he was safe, that for the most part we were both safe. One of the questions that I get asked is would I do things differently if I knew all of this ahead of time? 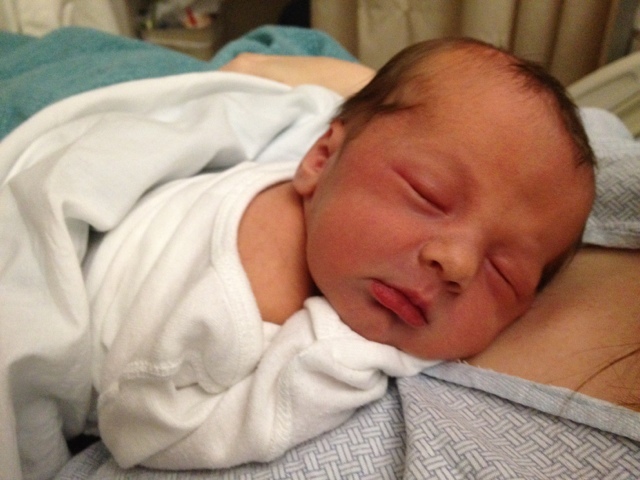 Would I have given birth in a hospital instead of a birthing center? I probably would have chosen differently but, my labor and delivery were exactly what I wanted. I did not want all the complications afterwards but, everything else was just as I had imagined. We arrived at the birthing center at a bit after 6 in the morning. I was so glad that I had gone into labor on my own and that I would be able to have the baby there. It was so nice to be able to put on my soft meditation music, diffuse some essential oils in the air and most of all not being hooked up to anything. I could move in any position I liked. The student midwife would come and check the baby's heart rate hourly to make sure everything was okay with him but other than that there was very little intervention. At around 9:30 things started to change. I started into transition labor. I remember telling Jonathan at this point that if I had access to an epidural I would take it. I remember also feeling and thinking thoughts I had never had before. I started praying fervently for help. I wanted to be able to do this but I knew I needed some divine intervention. About this time as the contractions were at their worst, I heard a voice that said "Melanie look at the contractions as a bolt of electricity coming through the top of your head, going down through your body and out your cervix. Don't hold it in. Let it go out your cervix." I remember thinking that is a great idea because before, I could feel myself holding onto the contraction instead of letting it go. I also had some other profound thoughts more around Christ and the atonement. I thought " I am in so much agony right now and I am doing it for this little one. I just can't imagine what Christ went through for me." I had gone to a place that I had never been before. I had experienced pain like never before and it really helped me gain a greater appreciation for my Savior and what he must have gone through. About this time I started feeling a great urge to bear down. They checked me and I was at an 8. They suggested that I get in the tub that it would help relax me and if I could rock back and forth it would help me to dilate faster. Well, that was absolutely true. About 10 minutes later I felt the absolute most overwhelming feeling to push. It wasn't something I had ever experienced before. I couldn't do anything but just push. Even when she told me to wait so she could check me, I couldn't. I literally could not wait. I was still in the tub and had pushed Andrew's head out but they told me not to stand up until we got the rest of him out. So, Andrew was born in a big jacuzzi tub. I was able to grab him an hold him on my chest for about 20 minutes. He was born at 10:38 But, he was having problems breathing. He was struggling for breath. So they took me out of the tub and we went back to the bed. It was a bit scary for me as I was still holding him and saw his struggle. As we were in the bed, they were trying to detach my placenta without any luck. I didn't think much of it as all my attention was on my baby. All of the sudden the midwives got serious and said they needed to hook me up to an IV because I wouldn't stop bleeding and they needed to get some Meds in me. So they gave me pitocin with no luck. They tried a few other things and than the next words were "call an ambulance I can't get the bleeding to stop." They also had forgotten to cut the umbilical cord. So, Andrew was still receiving blood from the placenta. because it was still attached to me. I was lying in bed on Sunday January 27th talking over my day with Jonathan. We always love Sundays. It seems like a day of renewal and new starts. We were discussing Aubrey and her due date as it was just 2 days away and she was so anxious to have her baby. Jonathan made the comment to me that he told Aubrey that whoever's baby is born first will be the better baby. I laughed at that thinking that of course her baby would be born first. As I was nodding off to sleep, I felt my water break. My first thought was "you have got to be kidding me! I still have 3 weeks left. I am not ready for this and that somehow Jonathan's remark had caused this." So I woke Jonathan up and called my midwives to let them know. I learned with Adalyn that it is better to let my contractions get a pattern before going in. I was having no contractions at all. So, I went to sleep. I went and visited my midwives the next day and I was at a 3 but their were still no contractions. They suggested a few ways to get contractions going with one of them being castor oil. Oh! I hate castor oil. So I told them I would let that be my last resort. They informed me that if I hadn't started good contraction by 9:00 that evening that I wouldn't be able to use the birthing center. Because of their policy, 24 hours is all they would allow a woman to go without some type of intervention. So I really wanted to give birth at the birthing center. I could have much more control over my labor and how things were going to turn out. So, at around 4:00 I took the castor oil. Aubrey had this brilliant idea to put the castor oil in veggie caplets so I wouldn't have to taste it. The only downside to that was in order to get 2 full ozs. we had to fill about 30 caplets. So we did that. I was completely waterlogged after taking 30 caplets of castor oil. At around 8:00 there were no signs that the castor oil had even worked. All that work to not have to taste the castor oil and it didn't give us any results. I was sorely disappointed. I had just lost 4 hours of time. So, Jonathan and I went and walked the mall. We walked and walked until I was so exhausted. It did bring on contractions but they weren't heavy or regular. I was frustrated at this point. By this time, it was 9:00 and I called the midwives to tell them. They told me that they would give me until 9:00 in the morning but if nothing happens, to just go straight to the hospital and check myself in. After realizing the castor oil needs to be swallowed directly, I decided to do that instead. So, Aubrey put it into some Dr. Pepper and I drank it like that. It took a good 10 minutes of constant encouragement to be able to do it. That stuff is nasty. She also held a bottle of peppermint for me to sniff afterwards so I wouldn't have to smell it. She was such a great help. Feeling very discouraged, I went to bed. Around 1:30 in the morning the castor oil hit and did its job. My contractions started hard and intense around 2:30. I timed them until around 5:00 and called the midwives. They asked if I could wait and come in at 6:00 as they were at the birthing facility in Murray. They needed to get to Orem. So, I woke Jonathan up and I got all my stuff together. We left around 5:30 in a nice snowstorm. It was still surreal to me that we were having a baby. I felt like I needed those 3 extra weeks to prepare mentally. Plus, Aubrey's baby was supposed to come first. This is the question I get most of all when people find out I am pregnant. I know this is a legitimate question because of my age and all the other things that have transpired at the same time, such as Aubrey being pregnant also. I have put off writing this post because of the sacredness of the experience I am about to share. But, have felt like I need to share these things. After I had Haylee, I was very content with my four children. I had two girls and two boys. I felt like I could be done and be absolutely happy. When Haylee turned 3, both Jonathan and I felt that we needed to pray about our decision to make things permanent. So we both prayed about it together. At this time, I was given a very special experience. Nothing like this has happened to me before or since. I was told in my mind that we were not done that we still have a son waiting to join our family.It was not something that I can even describe. It was a feeling that filled my whole body not so much words but feelings and a complete understanding that this little boy needed to join our family. So, Jonathan and I wanted to be obedient and we did what we could to obey. It took me a long time to get pregnant which is not like me at all. Almost 3 years went by since I had received that very special witness. I wondered if I would ever get pregnant. But, I never questioned the witness that was given to me that I was to have another child. So we had Adalyn and she has brought us so much joy and happiness. I am so thankful she is part of our family. She is my girl with tons of personality. All I can say is that the Lord puts people in our lives to help us make the right decisions, even if those decisions are hard ones. So my sweet sister who already knew this whole story came to me and told me to think of that sweet spirit who wants a body. In the long grand scheme of things, this small sacrifice to choose to become pregnant is very small.Now, I say choose here because it still had to be my choice. The Lord has given me free agency and it needed to be my choice. I knew she was right. So, on Halloween of 2011 I went and had my IUD pulled. That was a big decision for me. But, I knew it was right. 7 months later I still was not pregnant.I have really got to admit that I had been relieved for all these months. Than one Sunday at the end of May, we were all sitting around the dinner table and Aubrey announced to all of us that she was pregnant. I was very excited for her but, my next thought was maybe our little boy was reassigned to Aubrey and Alex. I told Jonathan that I would not be pregnant with my child and I was going to make an appointment with the doctor to get my IUD put back in. Well, two days later I found out I was pregnant also. We are both having little boys in February. I have gone through so many emotions with this pregnancy. I get all kinds of comments from lots of different people. Some of them good, some of them not. I have just tried to remember that My Heavenly Father's will is not always what I thought I wanted but he knows best. I have fully put my trust in the Lord and allowed my will to be swallowed up in his. I already love this little boy so very much. He is what will complete my family. I am very excited to meet him. So it looks like we are making things even here, 3 boys and 3 girls. But, I have known this little boy has wanted to come to this family for many years now. Anyway, I am excited to meet him. Plus, he will have a nephew as soon as he is born. 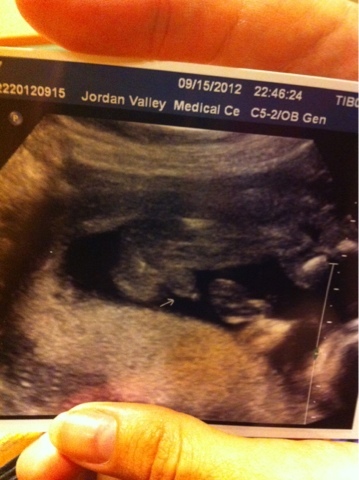 Aubrey is also having a boy. Babies, babies everywhere. Now, the hard part is coming up with a name that we like. 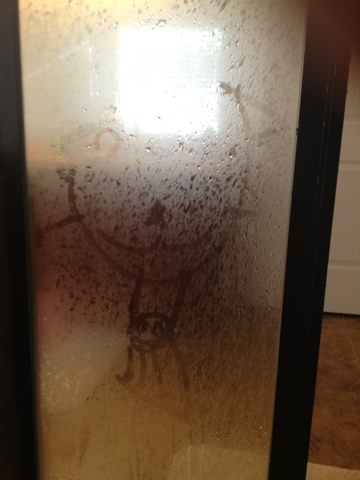 Adalyn drew this picture on the shower door this morning. She spends more time drawing pictures than actually bathing. It is so cute. She said "this is a picture of mommy and my baby brother in your tummy." "Your actions are speaking so loudly I can't hear what you are saying." I am first and foremost a mom. I have 5 great kids. I have been married for 19 years. I am still trying to figure out what I want to do when I grow up. I love watching basketball, refereeing basketball, playing basketball... I come from a great big family and love them all...... I love the gospel of Jesus Christ. I truly have the desire to be better because of this. I believe I am the creator of my own world. My life is just how I created it to be.